The lesser-known Irish beer and where to find it this St Pat's. St Patrick's Day in the US conjures images of pints brimming with white foam and dark beer, the word Guinness etched into the glass. Some say not drinking Guinness on March 17 would be a crime, but there's another beer with an even longer tradition in Ireland. Irish red ale has been around way longer than Guinness; Smithwick started brewing its Irish red 40 years before Guinness opened its doors. In Ireland, stouts and reds share the spotlight. "Pale ale or pilsner is seen as a girl drink or for the morning," is how Gena Engelfried—former Ireland resident, lover of Smithwick's, and my own mother dearest—explained the nation's affinity for stouts and red ales. Those lighter types of beers, she says, "just don't taste like much compared to stout or porter, no nutrition!" While my mom is not a beer expert, she does have a point. The Irish make and drink malty, sweet beers—in part because of the high English tariffs once placed on hops, but also for the warming flavor and full belly feeling of a stout, porter, or Irish red. So what is an Irish red? Irish reds get their reddish, amber hue from the roasted grains that are used in the brewing process. They have a caramel-like, malty sweetness and subtle, nearly nonexistent hop flavor with an alcohol content ranging from 4-5.5 percent. Kell's brewer Garrett McAleese describes the beer as particularly "sessionable," both light and dry, but flavorful with a toffee-like sweetness. In true St Patrick's Day tradition, easy to drink all day. Purists will be quick to tell you that a beer is not an Irish red unless it is brewed with Irish or Scottish yeasts and a blend of English, caramel, and black malts. I will be quick to say, that's not what I'm thinking about when I drink a beer. In the Pacific Northwest, however, if it isn't hoppy it may as well not be beer. Alejandro Brown, of Big Al's Brewing in White Center, is a self-proclaimed "malt guy more than a hop guy." 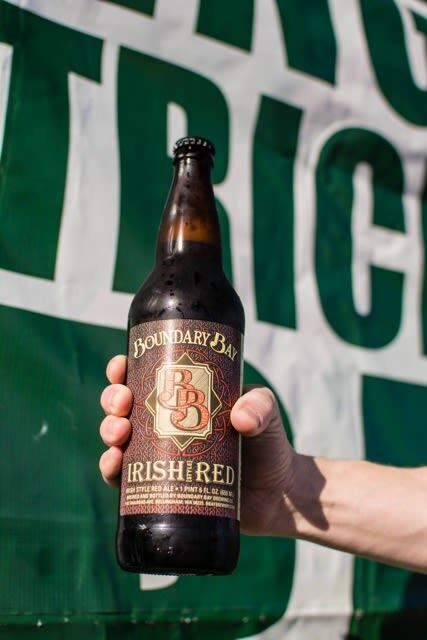 He took note of the PNW's IPA-saturated market when opening his brewery eight years ago and, to differentiate their brand from others, made his first brew an Irish red. Eventually, Brown added an IPA, an amber, and a blonde to Big Al's year-round collection, but that caramel, malty, traditional Irish red ale is what initially set the brewery apart. Even still, ordering an Irish red brewed locally will usually get you the Northwest version of the brew: think triple IPA and a stout have a baby: an ale with an emphasis on Northwest hops and a higher alcohol content. To complicate things more, American red ale is something entirely different—essentially amber, hop-forward, not smooth, and sometimes incredibly sweet. All notes and technicalities aside, where can you find an Irish red this March 17?